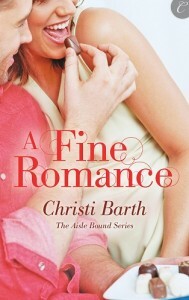 Thanks to everyone who stopped by last week to drool over some of the desserts featured in Christi Barth’s A Fine Romance. The winner of a digital copy of A Fine Romance is…Sherry J! Didn’t win? Here’s more about the book and where you can find it. Don’t forget that this week you can win a $10 gift certificate for yourself and a contemporary romance author in my Contemporaries to Covet giveaway!